Coathanger Review - This is the best I have found! How annoying is it to open your wardrobe each morning, to be greeted by an array of clothes that you can’t really see because either they are stuffed in amongst other clothes, or are at a different height to the rest so hidden from view. And then, when you start to move things around, you have to be so careful not to disturb items that will fall from the hanger at the slightest thing. It makes choosing an outfit not only more time consuming, but also less of a pleasure. I have been looking for a product that helps with this problem for a while, and about a year ago I came across the velvet style hangers** which I have to say are simply astounding – and I personally don’t use anything else now. I don’t recommend things lightly, and only when I have tried them personally, but these are not only tried and tested by me but by so many of my friends, family and clients that I feel it would be rude not to introduce them to you! The hangers** are slimline, and you will not believe how many more items you can fit into your wardrobe now – I was amazed! It helps you get a bit of breathing space back into everything! (I advise them for this purpose rather than to enable you to fit even more clothes in!). Whenever I have used them I always get between 25 and 50% more space in the wardrobe – amazing! They are flock velvet coated, which means that not even silk will shift once put on them, This makes them excellent for holding strappy dresses, silk blouses etc….. They are inexpensive (around £20 for 50 so 40p each!, but sometimes on sale too) – especially in todays financial climate, it is important to know that you are getting value for money, but sometimes items can be priced for so little you almost wonder whats wrong with them (don’t you just love our thought process!). You can purchase great coathangers from other shops, but some can be as much as £5 each – and when you need to get lots then this adds up too quickly. 50 coathangers is perfect for a decent sized wardrobe for starters, and you can always get more if required at this price! They look great! Its so lovely when you are getting organised to feel that real sense of satisfaction, and nothing beats opening your wardrobe everyday and being greeted with an orderly line up of your clothes, ready for you to pick out! The black colouring makes clothes stand out more too. One thing is that I have had 2-3 break on me. Usually when I haven’t aligned them in my wardrobe and they have been bent and snap on the door – so you could say its more down to me than them – but its still a pain. I think that the positives completely outweigh the negatives, and even if you had a few break over time, they are so well priced in the first place that this won’t feel like a sting too much. I do still use wooden hangers for jackets as they are bulkier, and also clip hangers for skirts. Previous Post: « HOW TO LIVE A BALANCED LIFE EVEN WHEN YOU’RE TOO BUSY – THE METHOD THAT WILL CHANGE YOUR LIFE! In the US, these are available in packs of 3 at Dollar Tree! I don’t know why I haven’t considered them for use at home! I picked up a set of them, and put them in the patient rooms at work though, I’ve noticed that they’ve worked beautifully, especially when you know people are hurrying and not carefully hanging… Can’t say why I’ve never thought about buying myself any! Brilliance I suppose! LOL! Thank you for your wonderful blog. I’m on Day 12 on your decluttering plan and SO happy I started! 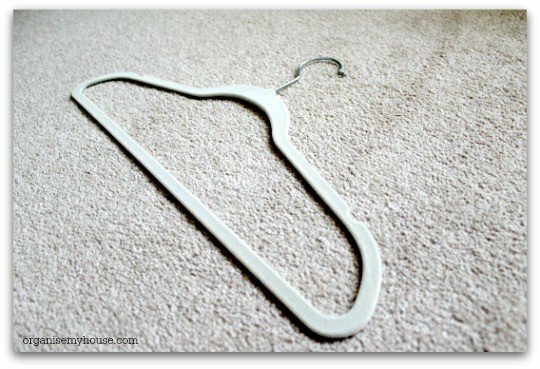 How can I be so obsessed with hangers – it’s ridiculous and I need to look at myself in the mirror, but I am – and these are the king of all hangers!!! Glad you like them as much as me!